In the life of an organism, the function of proteins is achieved by the interaction between proteins and proteins. Therefore, the study of new proteins can provide new directions for the study of the potential function of proteins. In many protein tests, pull-down assays are often used to test protein-protein-interaction. 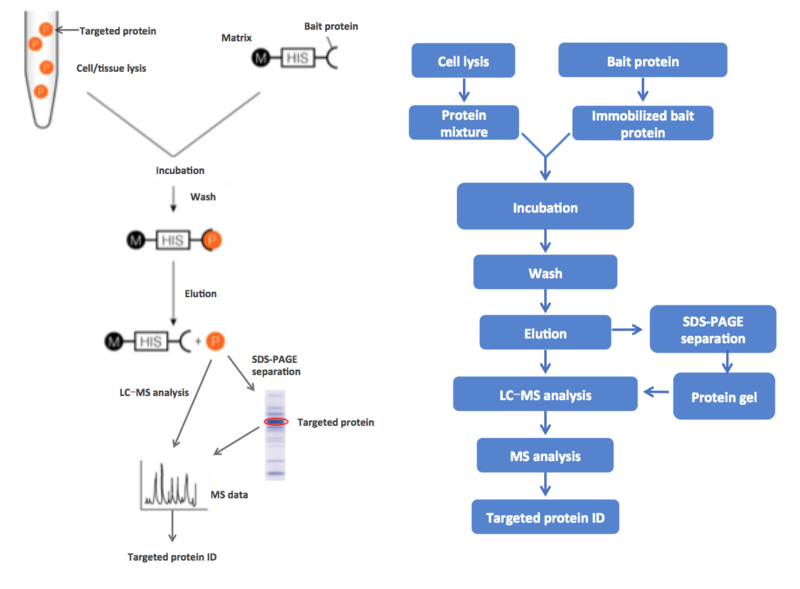 Pull-down's experiment uses highly purified and enriched bait protein to capture the targeted proteins that specifically interact with the bait protein in the cell, and greatly improve the efficiency of identification of new target protein. The specific steps of pull-down's experiment are to express the bait protein modified with poly-His, or Biotin tags. Using immobilized affinity ligand to link the bait protein to the solid-phase matrix, and then mix the bait protein with the protein sample. In this process, targeted protein specifically interacts with the bait protein, and thus, the targeted proteins are isolated from the protein sample mixture. This process can be used to isolate and concentrate a particular protein from a sample containing many thousands of different proteins. Identification of the target protein is then processed by the mass spectrometer. Using CST pull-down assay kit, combined with advanced UPLC-MS platform, MtoZ Biolabs provides quick and accurate pull-down protein analysis service. 1. Coomassie Blue, SYPRORuby and Silver staining can be all accepted for protein analysis. 3. No destaining treatment is needed for silver stained protein samples. 1. There is no specific requirement for samples with amount of protein > 10 ug. 2. For samples with amount of protein < 10 ug, SDS and salt should be reduced in the solution. 3. Please provide information of the buffer system used for sample preparation and estimated amount of protein in the solution.